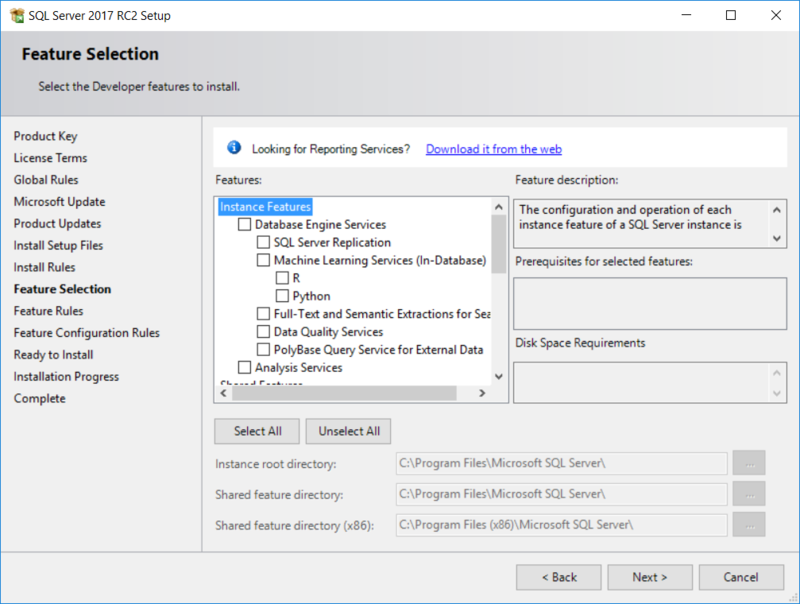 Database administrators can use this setup guide for SQL Server 2017 installation which has been released by Microsoft recently as the next data platform solution. SQL Server 2017 takes attention of especially data scientist with its new tools provided for Machine Learning and Artificial Intelligence besides the Database Management tools (disk based or in-memory databases), Business Intelligence tools (Reporting, Analysis and Integration Services), Big Data and R development. Especially Python development on SQL Server enables tools for developing machine learning solutions on SQL Server. 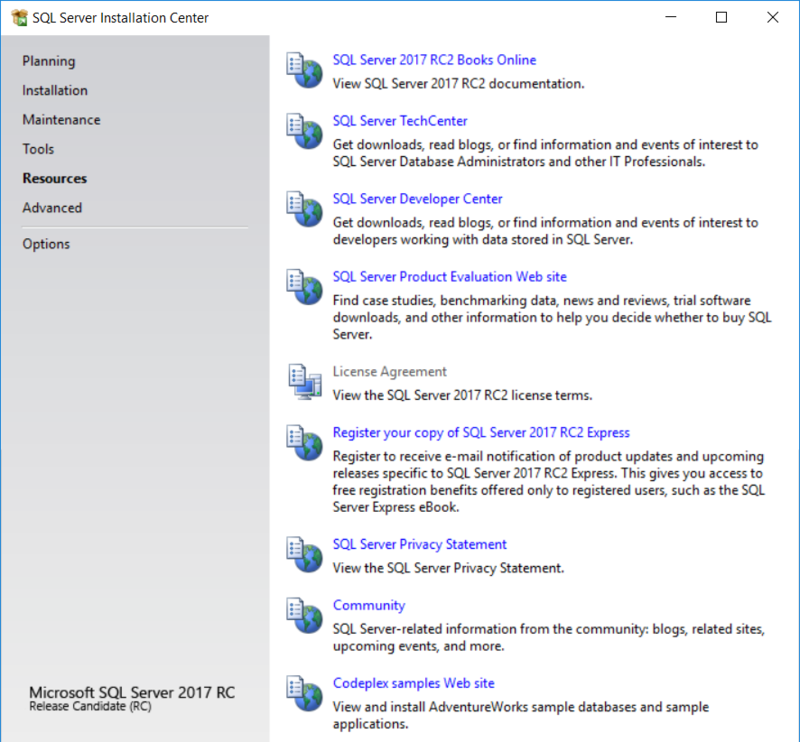 Within this SQL Server setup guide I will demonstrate step by step SQL Server 2017 installation as a stand-alone server also as a named instance only for Database Engine setup. I assume you followed the steps in download SQL Server 2017 guide. 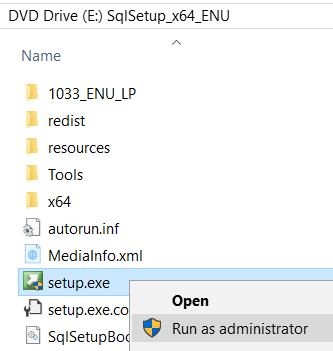 I downloaded the SQL Server 2017 setup file in .ISO format and map as a disk drive. 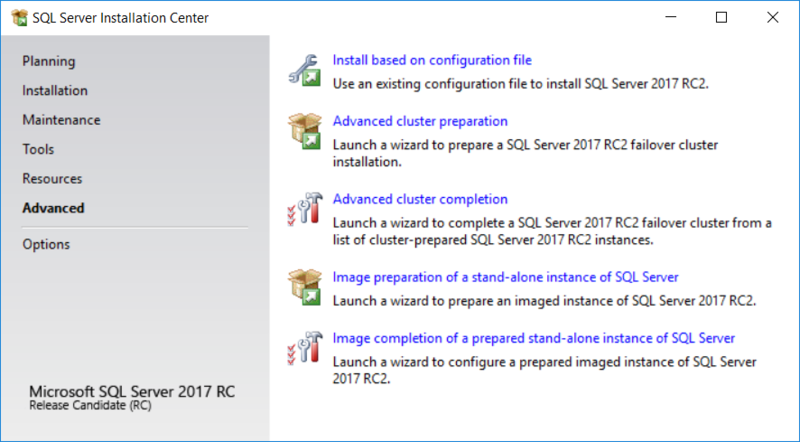 SQL Server Installation Center will be displayed for SQL Server 2017 setup and configuration. 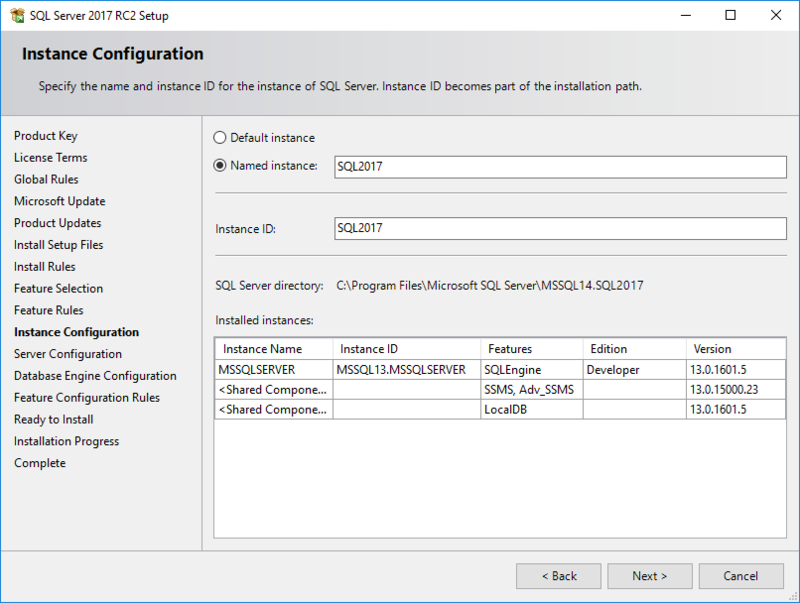 Advanced configuration options for SQL Server 2017 setup. 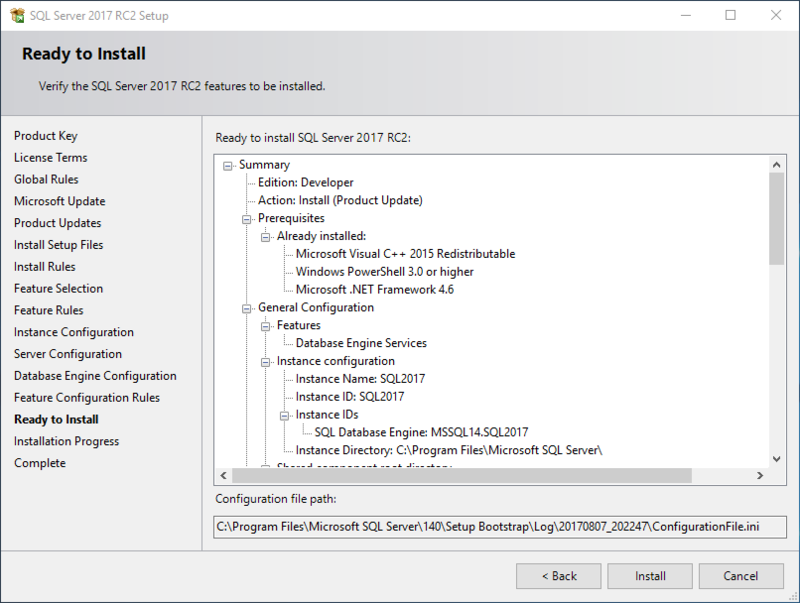 Since I want to evaluate the new features coming with SQL Server 2017, I chosed a stand-alone SQL Server 2017 installation. System Configuration Check Report is created at "C:\Program Files\Microsoft SQL Server\140\Setup Bootstrap\Log\20170806_224959\SystemConfigurationCheck_Report.htm"
Soon I will be listing the features of SQL Server 2017 which can be selected seperately for installation or as an addon to an existing SQL Server instance. Please note that there is a special note for SQL Server Reporting Services, SSRS can be downloaded at Microsoft Downloads portal. But for simplicity I'll not deal with Reporting Services. Instead I'll concantrate on installing SQL Server Database Engine setup. Includes extensions that enable integration with R and Python languages using standard T-SQL statements. Includes extensions that enable integration with R language using standard T-SQL statements. Includes extensions that enable integration with Python language using standard T-SQL statements. Each shared feature is installed once within a defined scope and operates within that scope. The defined scope can span all SQL Server versions on a computer (e.g., SQL Server Browser), can be isolated to one major version of SQL Server, or can be isolated to one or more minor versions. Includes Microsoft Machine Learning Server for Windows that provides parallelized big data analysis, transformation, modeling and operationalization capabilities. Includes Scale Out Master for Integration Services Scale Out. Includes Scale Out Worker for Integration Services Scale Out. Just for now I'll only choose to install the Database Engine Services without any other features. All other features can be installed later. Server administrator or setup admin can choose to change the default instance root directory. But for a Developer Edition I'll keep it unchanged. SQL Server 2017 Database Engine Services requries 1 GB (1001 MB) disk space. Press Next button to continue with next step in the setup wizard. Instance Configuration enables database professionals to configure the SQL Server as the default instance on the server or as a named instance. Since I have already an other SQL Server version (SQL Server 2016) installed as default instance on my development computer, I had to install the new SQL Server 2017 instance as named instance. I called it "SQL2017". 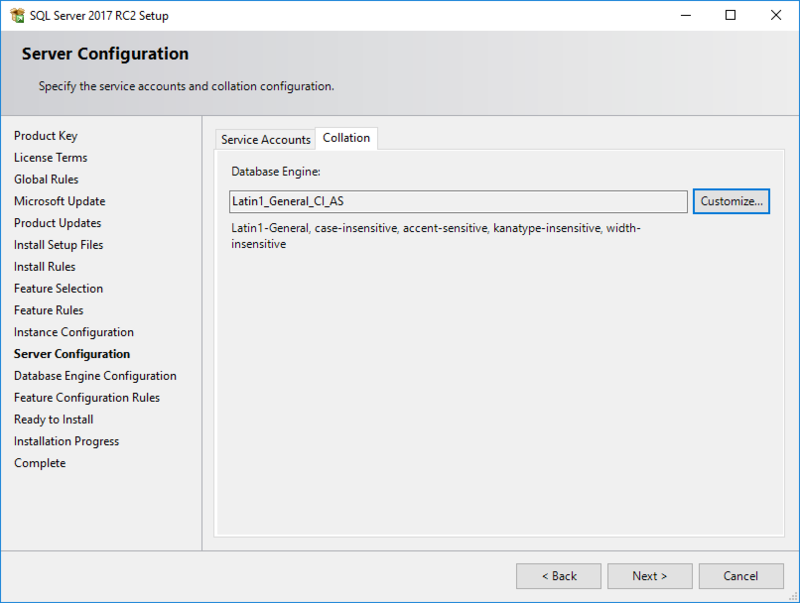 So I can reach the SQL Server instance later as "local\SQL2017" on the database server, or using the computer name in front of the instance name like "kodyaz\SQL2017" for remote connections in database connection strings or SSMS login screens. As seen in the screenshot, installed SQL Server instances from different SQL Server versions are listed. MSSQLSERVER is the default instance for version 13 which maps to SQL Server 2016 and is Developer Edition. After the setup is completed successfully, database administrators will be able to see the named instance added here..
Of course, if you have no SQL Server installed on the server or on your computer, the installed instances list will be empty. So you are free to choose default instance or even name your instance. 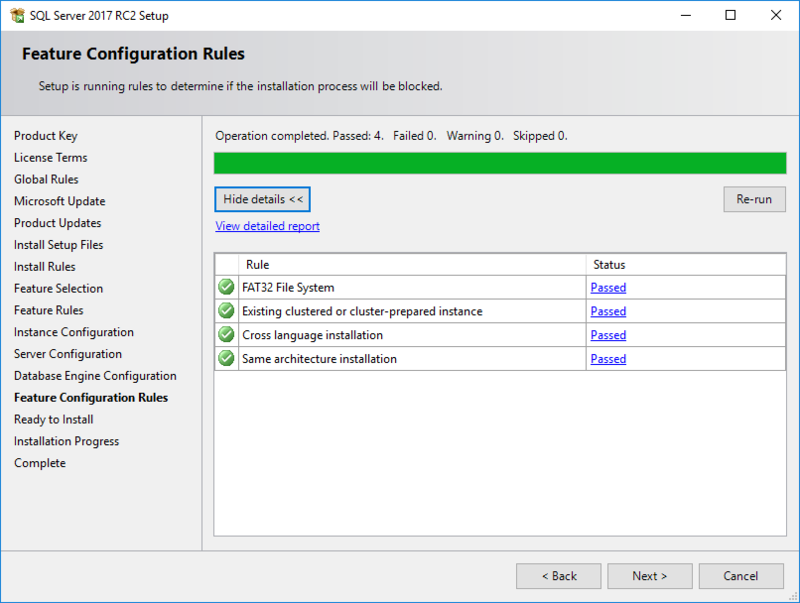 The following step in setup process is the Server Configuration where the service accounts and the default server collation settings are defined. 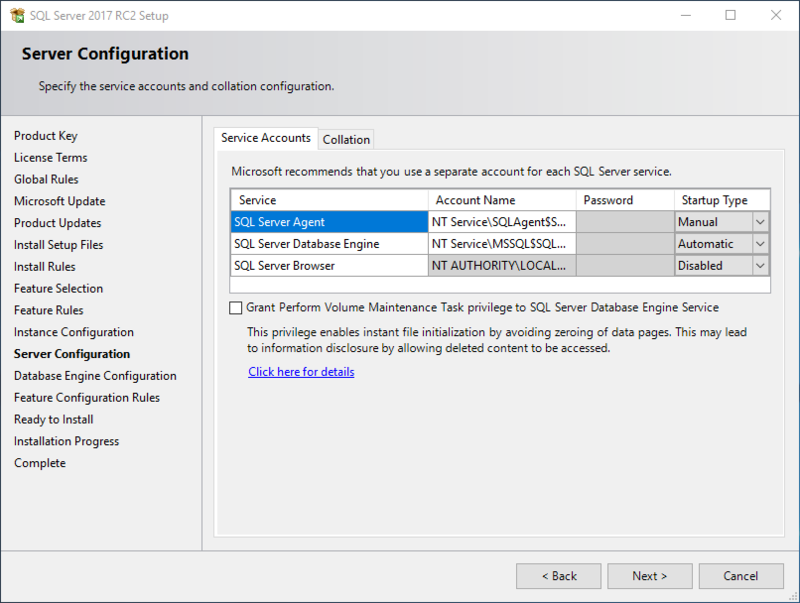 SQL Server administrators might require to configure these accounts if they want to enable these services to reach resources on the networks, etc for such specific cases or for security reasons. Database Engine Collation configuration is an other step here. 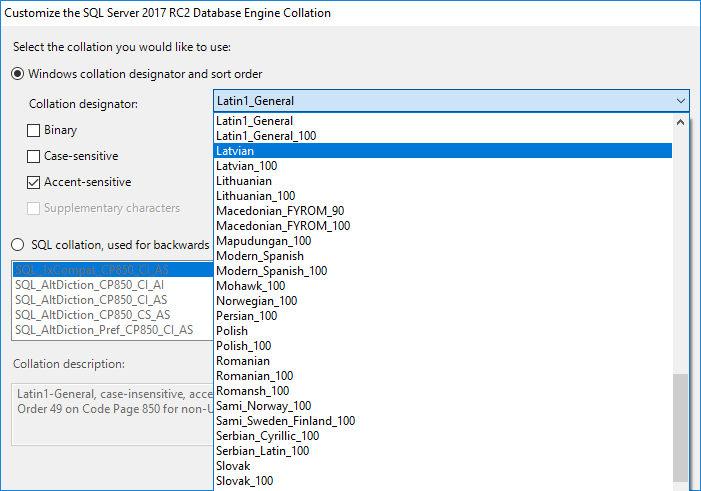 If you are developing a database solution for example to be used in Turkish, so the data stored in database tables will be all in Turkish you can configure to choose one of the Turkish collations as the database engine collation. But it is also possible to configure collation on the database level. I am choosing the "Latin1_General_CI_AS" as the default database engine collation for now. 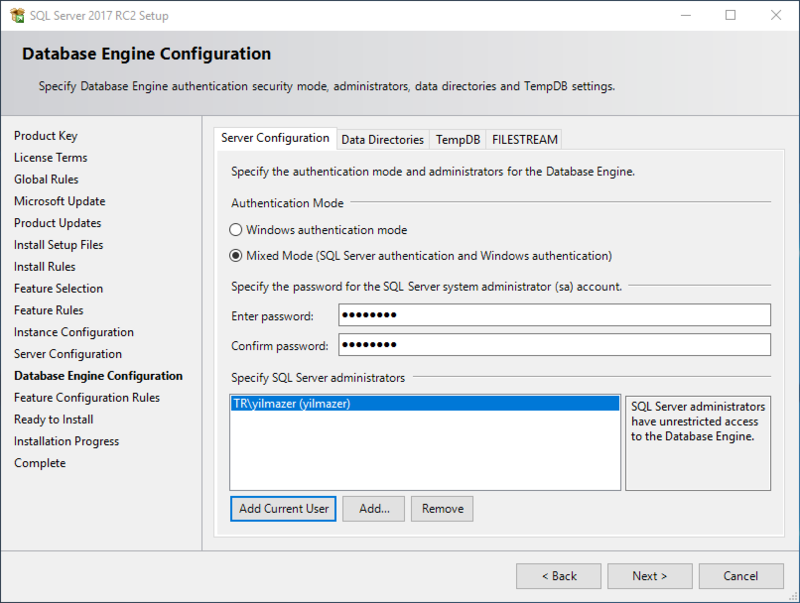 In Database Engine Configuration step, the first tab enables setup administrator to configure Authentication Mode and specify the SQL Server administrators. I always choose to configure the SQL Server authentication by using the Mixed Mode of course by providing a strong password for the sa user (SQL Server system administrator account). And press "Add Current User" to add your Windows user to the SQL Server administrators list to gain system administration permissions on the SQL Server instance. Of course you can specify additional users as administrator by adding their accounts with the "Add..." button. The second tab in the Database Engine Configuration screen is the Data Directories tab where system administrators can configure the folders and directories to be used for special purposes. I leave unchanged the default directory settings. But it is critical for performance to arrange data directories and log directories separate from each other. 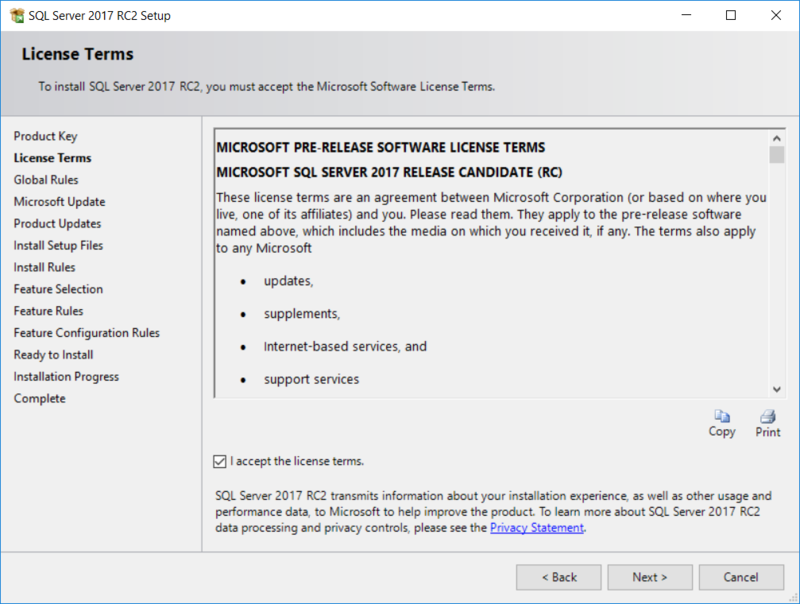 In fact, MSSQL14 is a hint for the SQL Server version so namely pointing to SQL Server 2017. The second part after the "." 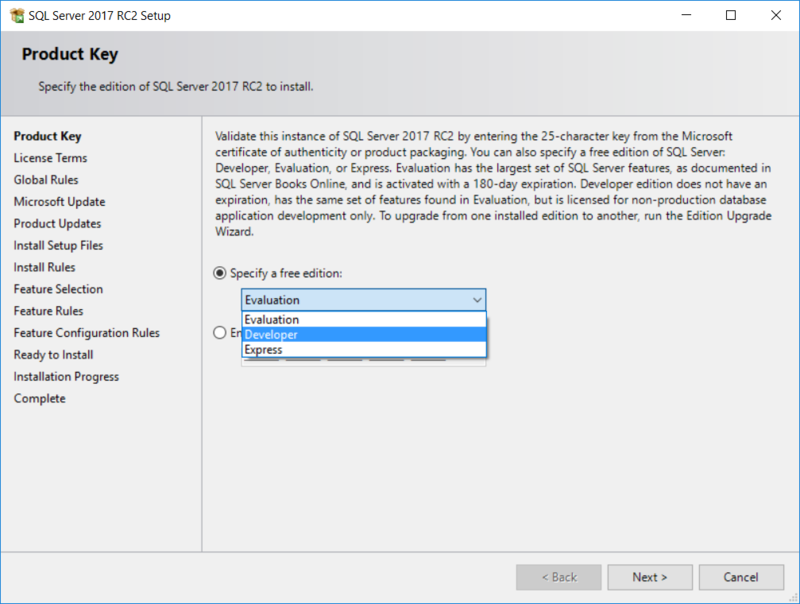 is the instance of the SQL Server installation, namely SQL2017 which I named previously. If you are installing default instance, you will only see the version identifier in the directory names. TempDB configuration can be managed on a separate tab. 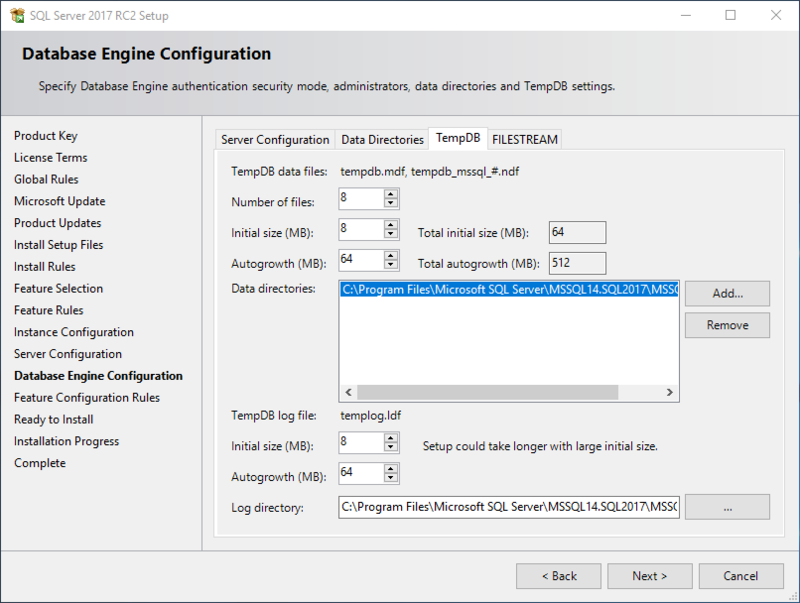 With enhancements introduced by SQL Server in previous versions, administrators can specify more than 1 TempDB data files for their server. The initial size of the tempdb files and autogrowth options can be specified too. AS seen in the below screenshot, TempDB Log directory can be configured too. FileStream configuration can be managed in the FileStream tab. 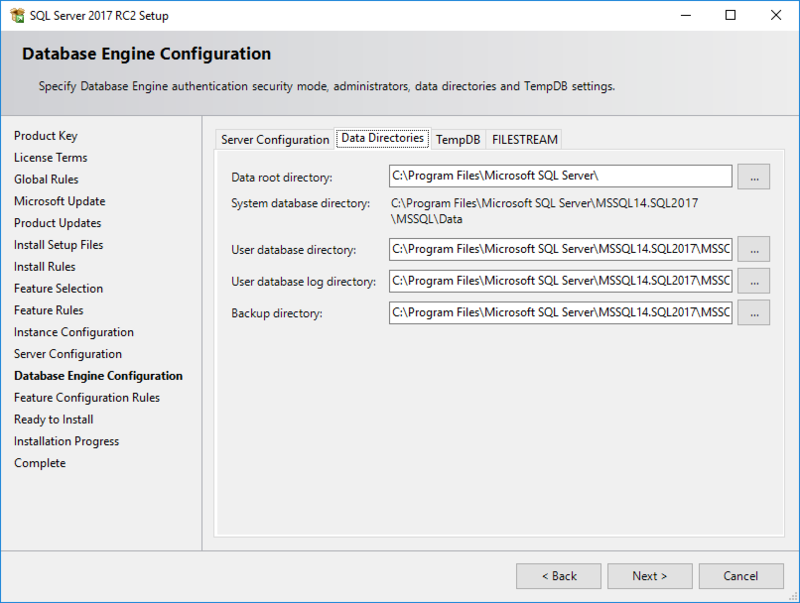 Although FileStream can be easily configured later on the SQL Server, since I am a fan of FileStream solutions, I always enable it immediately during installation. But it is disabled by default on the setup wizard. 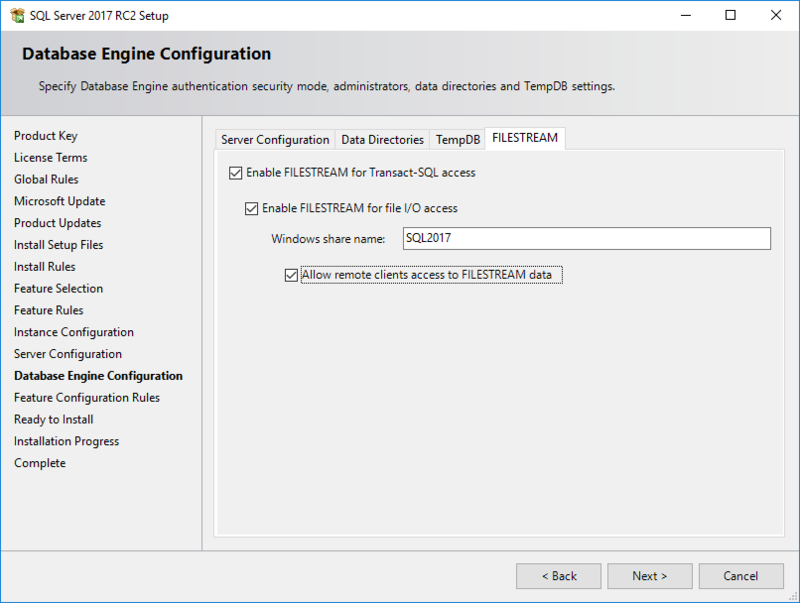 I mark checkboxes "Enable FileStream for Transact-SQL access", "Enable FileStream for file I/O access" and "Allow remote clients access to FileStream data"
After SQL Server 2017 installation, you will see a virtual file share named as here in the "Windows share name" which enables data write and read by putting files into the FileStream folder. 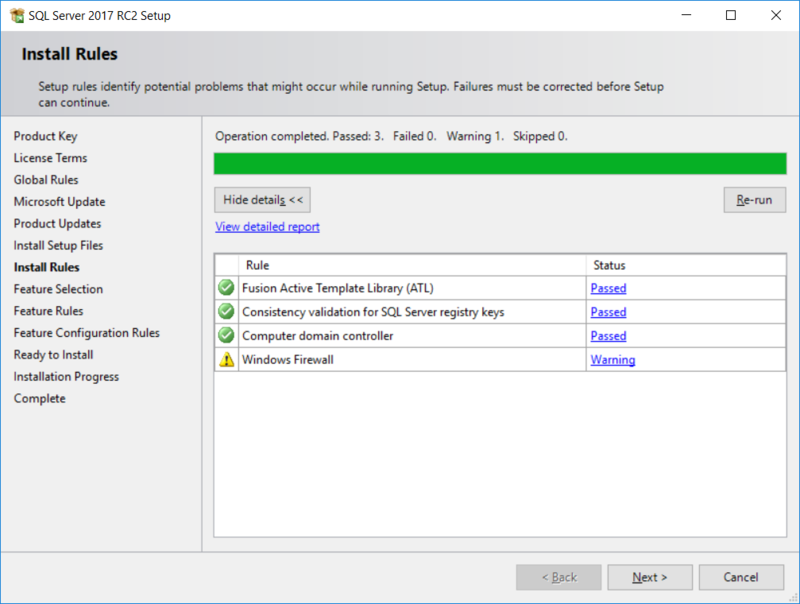 With completing Database Engine configuration, we can continue SQL Server 2017 installation with the next step "Feature Configuration Rules"
A list of rules defined by the features selected will be checked at this step and a visual and a detailed report will be created automatically. If you see all listed item in green then you can continue to install SQL Server instance. 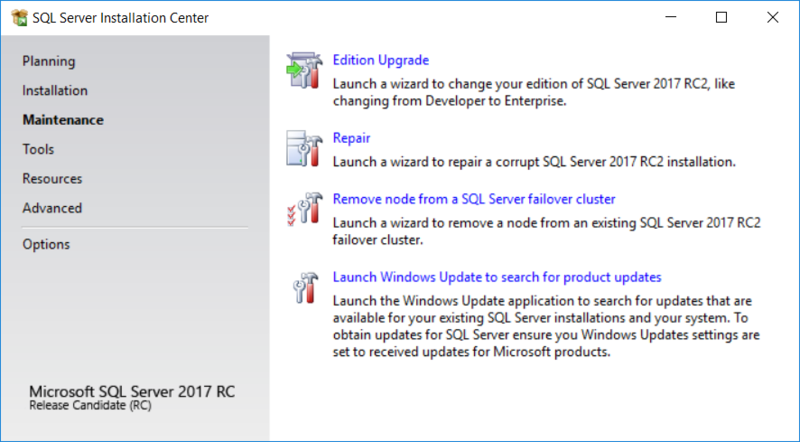 Now SQL Server setup administrators and SQL developers who want their new SQL Server 2017 database up and running, are very close to complete installation process. On "Ready to install" step, a list of selected options and features selected, etc will be displayed. 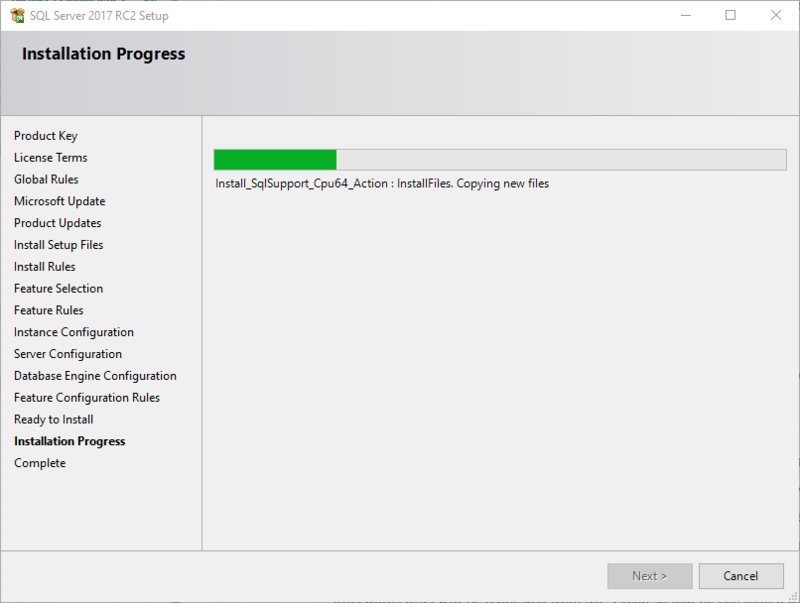 The configuration is also visible in the ConfigurationFile.ini file which is stored at "C:\Program Files\Microsoft SQL Server\140\Setup Bootstrap\Log\20170807_202247\ConfigurationFile.ini"
This verification step is the last stop where you can go back to previous steps and change your SQL Server 2017 installation options. 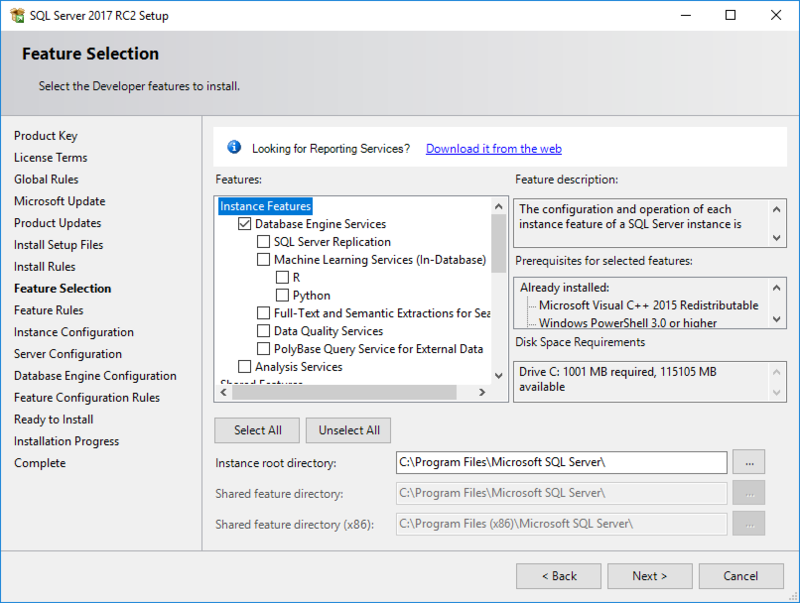 Of course after the setup is completed, you can add or remove SQL Server features using the SQL Server Installer but that might be a second task consuming additional time. 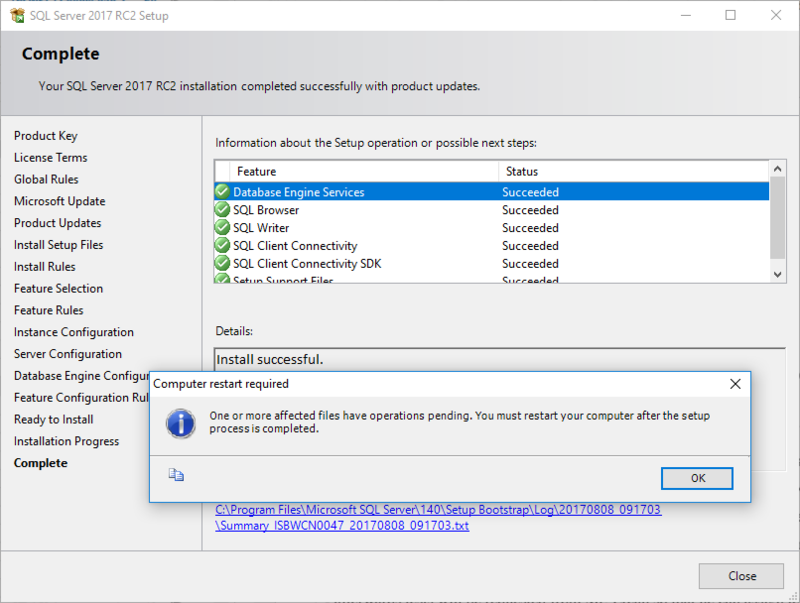 Start installing the binaries for the SQL Server 2017 by pressing the "Install" button. 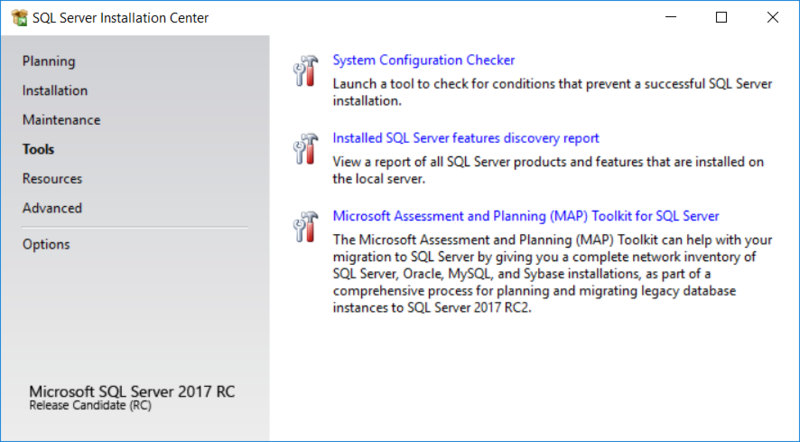 On my development computer, the setup of SQL Server 2017 database engine is completed only in 3 minutes. An installation log file is created as a result of the setup process which can be viewed for setup details. 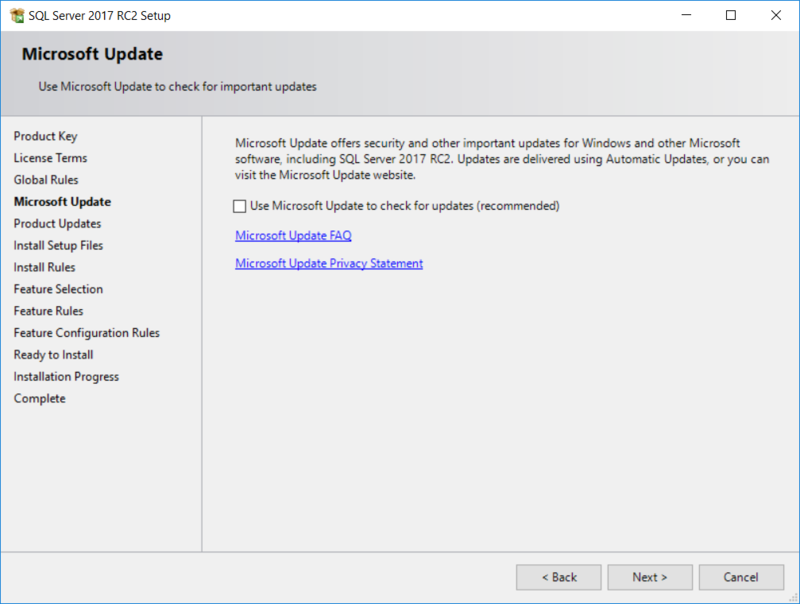 As I always do, after installing a new SQL Server version I logged on to SQL Server 2017 and checked the server version information. 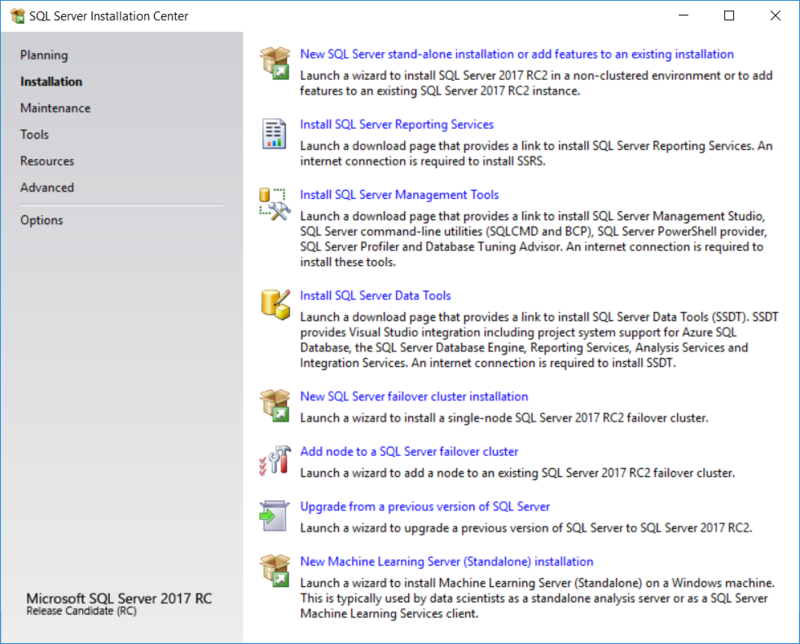 By the way installing SQL Server Management Studio for SQL Server 2017 is a common task after SQL Server setup. 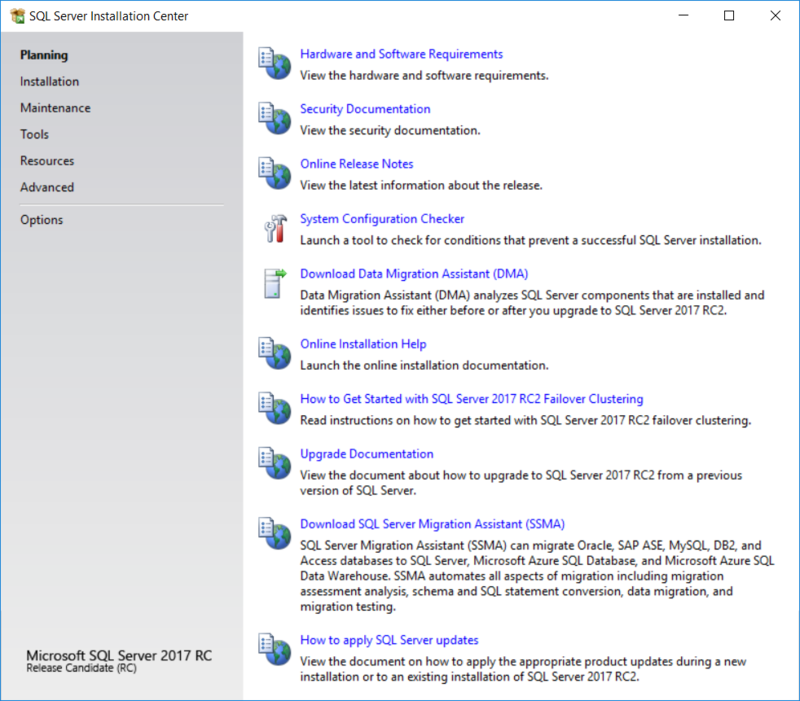 So SQL developer can also check the installation guide for the SSMS for SQL Server 2017.